← Rio bus system: reform at last? Marcelo Ramos, 38, is a telephone repairman whose wife, Gabriela Romualdo, worked in human resources– and whose dad, Gabriel, had an empty garage on his hands. Cleber de Araújo Santos, 37, managed part of an auto repair outfit for city and state vehicles. His wife, Marluce Maria de Souza, 31, owned a hair salon. 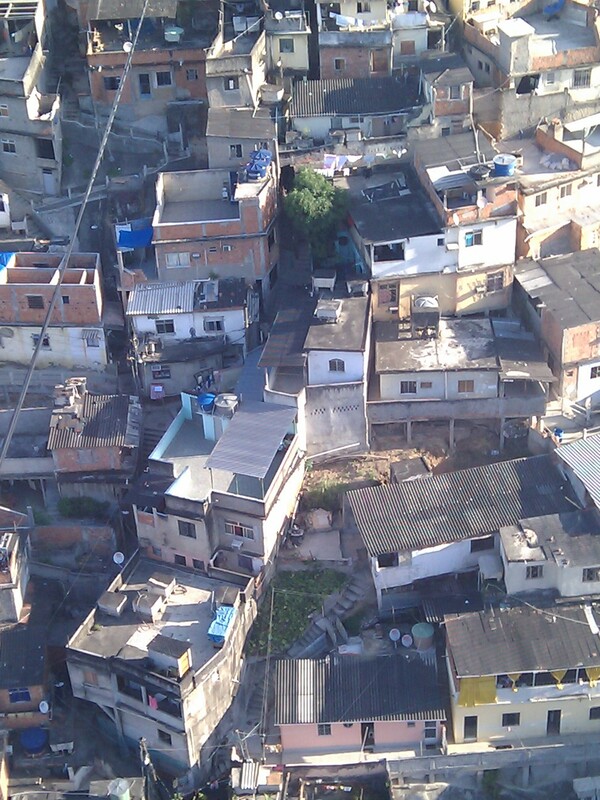 They all live in the huge stretch of favelas, housing about 400,000 cariocas, called Complexo do Alemão. Pacification — though still patchy there — has changed their prospects. The Brazilian army invaded Alemão in November 2010, in response to a series of vehicle torchings around the city. In mid-2012, soldiers handed the territory over to the pacification police. The beauty salon took a nosedive. 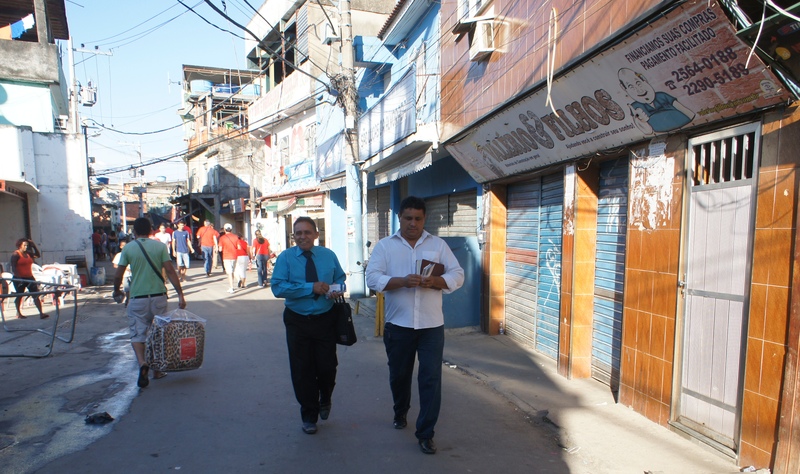 Marluce and Cleber say that, although the drug business is still active, the money flowing in Alemão began to dwindle. So they looked up — at the six-station cable car system, built with federal funds, which began running in July 2011. 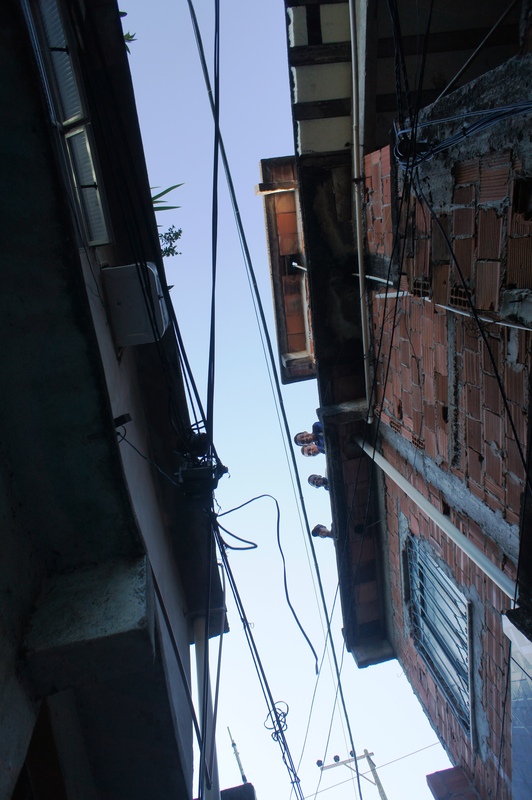 They looked beyond the favelas’ tangled electric wires, shops, motorcycle taxis, trash, kites, terraces and handmade homes. They thought about tourists — but not with the idea of taking them for a simple cable car ride. 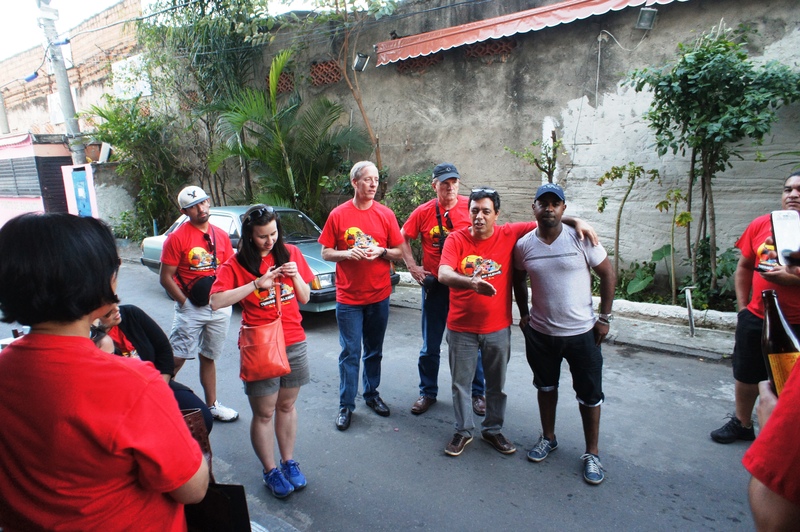 Last Sunday was the first time that Cleber and Marluce, who have a 13-year-old son, walked a group of tourists through a large part of Alemão, all wearing easily identifiable red t-shirts. After an initial stop at booths selling locally made (often from recycled materials) clothing, jewelry and souvenirs, the route began with one of the complex’s poorest areas, “Inferno Verde”, or “Green Inferno”. The guides wanted to hide nothing. Tourists often worry, with reason, that favela residents will resent their presence. But Cleber values friendly interaction, and plays the role of model, shaking hands, clapping backs, and shouting “Mengo”, which, with a Flamengo game in the offing that afternoon, repeated through the territory, where dogs trotted freely and residents played pool, drank beer, listened to amplified music and barbecued meat. Passing through narrow streets and apparently random open spaces, climbing down irregularly poured concrete steps, some of the visitors tried out a Tudo Bem?, sparking the requisite response, tudo bom — uttered with a smile. Alemão has seen a lot of death, in battles among drug traffickers, and between traffickers and police. Close to the international airport and highways, it long functioned as a depot for weapons and drugs. 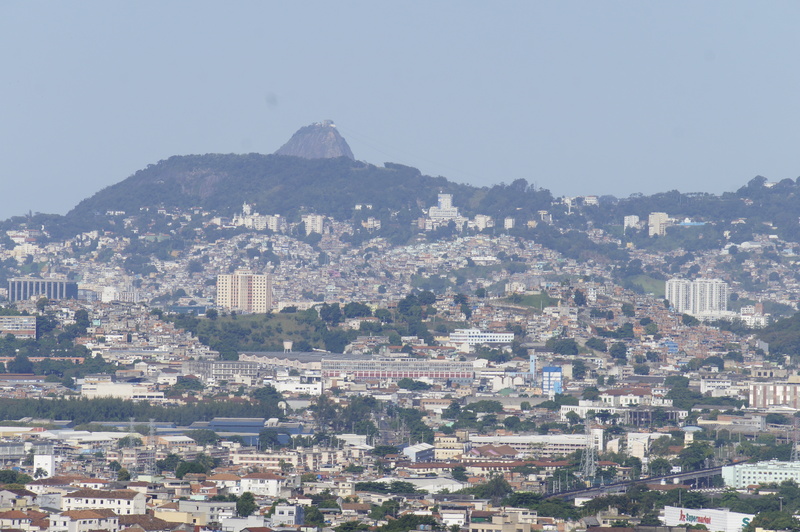 As pacification progressed in the South Zone in 2009 and 2010, Alemão became a place of exile for druglords on the run. Despite its appeal, with stunning views from cable cars, both of favela life from above and of the city as it spreads between mountains and Guanabara Bay, the Complex has proven to be quite complicated for Rio police and city services. “Comlurb (the city trash company) comes every other day — when they feel like it,” says Cleber. Only the week before Cleber’s red-shirted excursion, for MBA students and faculty from St. Mary’s University‘s Greehey MBA International Field Study program, police shot and killed an alleged drug trafficker, causing local merchants to shutter shops for two days. They said a drug boss had spread the message that they should do so, in mourning, just like in the old, pre-pacification days. In response to this and other, scattered, violence, police have beefed up their presence and intelligence efforts. 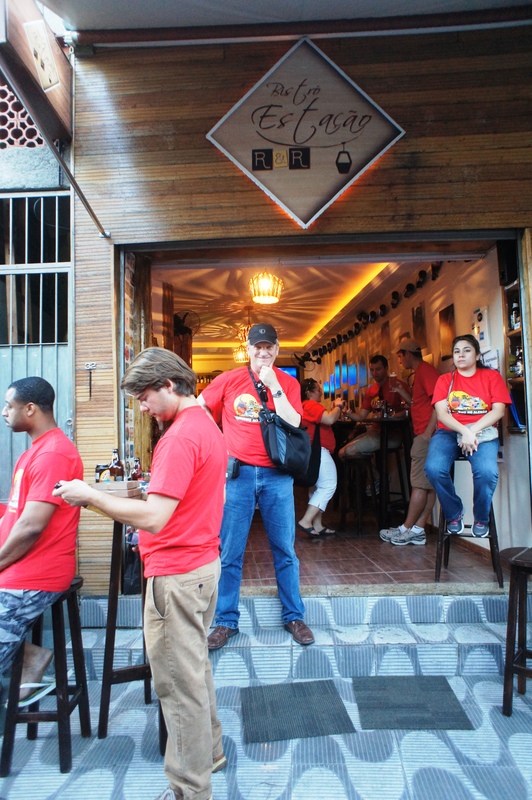 Despite the difficulties of pacification, residents are reaching out– to tourists and to new business opportunities. Hosts Cleber and Marluce have partnered to form the company “Turismo no Alemão” with tour guides Wagner Medeiros and Daniel Brandão, who help make the connection between “asphalt” and “hill”, as cariocas denote the formal and informal parts of the city. Like Cleber, Marcelo received training from Sebrae-RJ, which helps small business, through funding from industry in the state of Rio. After remodeling the garage himself, Marcelo installed air conditioning and awnings, with the aid of a zero-interest government loan. 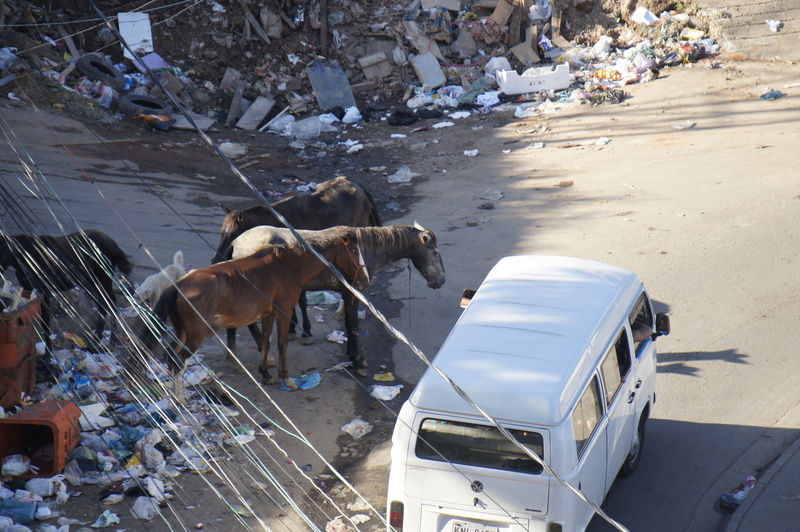 As for many other Alemão residents, trash was a problem when he first started out — five months ago. Though he’d planted trees and shrubs along a wall across the street from the Bistrô Estação R & R, so he could put out tables where patrons could drink, eat delicious croquettes and appreciate the live music (jazz, blues and Brazilian popular music) he provides, neighbors still threw trash there. Pacification began four and a half years ago, in November 2008. Police pacification units now tally 33, with more on the way for another complex of North Zone favelas, in Maré — and a goal of 40, total, by next year. The 2010 gubernatorial election saw Sérgio Cabral reelected in the first round of voting on the basis of his success in bringing down urban violence. Eduardo Paes, the mayor that cariocas love to hate, was also reelected in one round of voting, last year — to a great extent on the basis of a turnaround that pacification made possible. It’s likely that the governor’s successor, to be elected next year, will continue pacification in some form. Thorny problems remain, in areas such as police oversight, corruption, training and general manpower needs in a low-unemployment economy. It is well to remember that until last year, police didn’t receive overtime pay– the same as domestic workers. There are also many new public safety challenges on Rio de Janeiro’s busy agenda, such as the Pope’s visit this July and the FIFA Confederations Cup, next month. 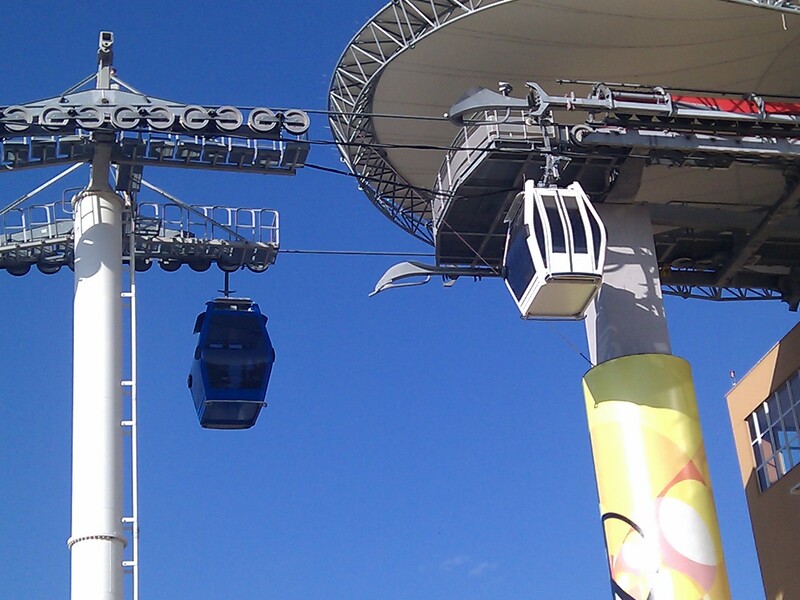 In Alemão, the cable car system, inspired by something similar in Medellín, Colombia, and only the first of several coming to Rio, reportedly cost about US$ 100 million equivalent. 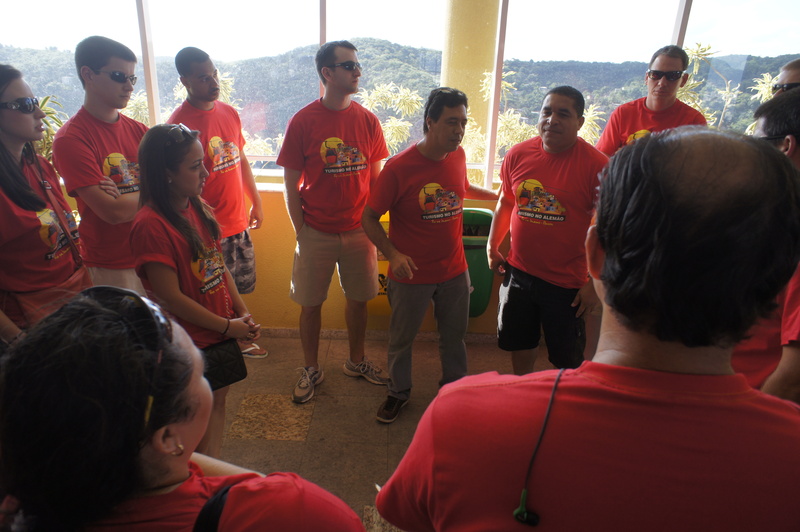 Many cariocas complain that it serves only those who live near the hilltop stations, and that the funds would have been put to better use for schools and daycare centers. Alemão has only one public school; most children must go outside the favela to get to class. With such issues unresolved, it’s not for nothing that the Bistrô’s Marcelo hasn’t quit his day job, though he’s gotten tons of press celebrating his establishment. So far, it could be that one of the greatest benefits of pacification are the connections that cariocas, both from favelas and the formal city, are now able to make, between themselves, and also with visitors from outside Rio de Janeiro. Without such connection, it’s impossible to discover the similarities and differences that bring us together and spice up our existence. Such discovery is central to bringing the asphalt and the hills of Rio into one united and just city. “Our visit to Alemão was the best day of our whole trip,” said one of the St. Mary’s students, who spent a week in Curitiba as well. 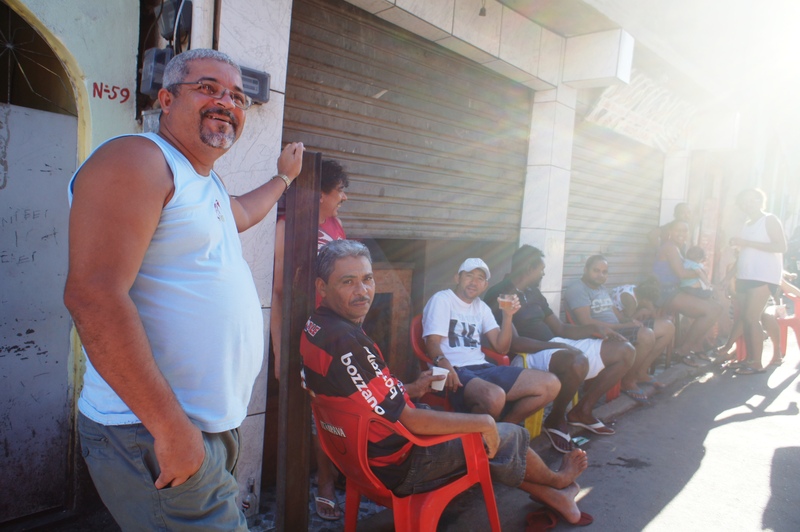 “I will remember it for the rest of my life.” School administrators are thinking of ways to partner with small businesses in Rio’s favelas; some students would like to come back and teach Marcelo how to brew his own. You can also check out other places here (in Portuguese) and here (in English). Feel free to add your own favorites, in the comments section. This entry was posted in Brazil, Transformation of Rio de Janeiro / Transformação do Rio de Janeiro and tagged Bistrô Estação R & R, cable car Complexo do Alemão, Complexo do Alemão, pacification Alemão, St. Mary's University's Greehey MBA International Field Study, tourism Complexo do Alemão, Turismo no Alemão. Bookmark the permalink. You should get in contact with a fellow, Zezinho, in Rocinha who is doing something very similar to this article. He is a tour guide from the community who has used his earnings to set up and operate a DJ School. People like those in the above article in Alemao and what Zezinho is doing is what should be done to show the favelas talents! I have messaged with Zezinho and you’re right, I need to make a visit! This is a great example of how pacification is changing the lives of the favela residents although I fear that there are many others who have not been as fortunate to receive training or to be as flexible to start in a new line of work. I have been meaning to go to the cable-car so this has given me some good guidance.